Bachelor programmes are taught in English and last three years. The programme covers issues related to International, Comparative and EU Law, as well as Economics, Finance, Marketing and Management. The programme will cover all the topics of a normal law degree but will do so from a transnational perspective, in addition providing an understanding of the relations between Law and Business. The purpose is to train candidates aiming for positions in business and international legal practice. This programme, which covers issues related to Law, Economics and International Relations, is offered by RGSL in cooperation with the University of Latvia. The purpose is to train candidates aiming for positions within foreign ministries, international organisations and NGOs, as well as for journalistic work in the media sector. Studies may continue on all RGSL Masters programmes, for example the LL.M in International and European law. Teaching at RGSL follows well-established academic traditions, with an international faculty composed of full-time and external professors and lecturers from all over the world. The teaching method is interactive, research-based and directed towards practical application. Holders of our Bachelor degree may enter the world of law, business, and diplomacy but may also decide now or later to continue on one of our Masters programmes. These offer either a specialised focus on international and European law, transborder commercial law or a continuation of the interdisciplinary approach such as law and finance and legal linguistics. RGSL graduates have found important positions in law firms, international organisations, and business corporations. 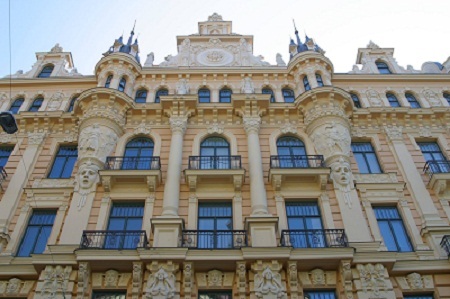 Riga Graduate School of Law (RGSL) offers legal education at an advanced level. The teaching methodology is research-based and extends beyond the field of law itself, offering access to related fields such as economics, business, and policy. Current degree courses include LL.M in International and European Law, LL.M in Law and Finance, LL.M in Public International Law and Human Rights, LL.M in Transborder Commercial Law, and LL.M in European Union Law and Policy. As a centre of excellence, RGSL is an independent institution within the University of Latvia and teaching is conducted exclusively in English. RGSL boasts an international student body, from the various European Union member and non-member states, the Balkans, CIS states, and the Americas. The international aspect of student life is a core element of RGSL development and diversity. The RGSL faculty is an important part of RGSL’s standing as a reputable institute of higher learning. The resident members of faculty offer in-depth knowledge in their respective fields of competence. Visiting professors from internationally recognised universities and organisations conduct much of the teaching. Leading practitioners from institutions such as the European Court of Justice and the EU Trade Marks and Designs Office appear as guest speakers on courses. In addition, the library facilities at RGSL are recognised as representing the very top level of law libraries. The programme in International and European Law integrates Public International Law, International Trade Law, and European Union Law, preparing students for careers in practice or administration at national or European level. The programme comprises both theoretical study and class work, followed by a Master’s thesis. The teaching methodology is interactive and based on a mix of lectures and seminars. The Law and Finance programme aims to show and provide an understanding to the relationship between the respective disciplines, highlight the complexity that exists. To understand this complexity, will help both lawyers and financiers develop regulation and legislation that matches advanced financial models. With a focus on EU law, the programme merges theory with global financial practise and standards to give students a more rounded view of multinational jurisdictions and regulation. The programme is intended for students who are interested in pursuing their professional carriers in international organisations, private law firms, public authorities, or in academia. The programme allows for a combination of courses from three tracks: European Union Law, International Commercial Law, Public International and Human Rights Law. The programme is designed to focus on practical aspects of transborder trade within the European Union and on international conditions framing European Union trade. It is designed to meet the needs of lawyers working in the private sector. The programme is designed to promote highly qualified experts with theoretical knowledge of both European Union law and policy issues. It covers integration, the role of the European Court of Justice, selected aspects under the second and third pillars, as well as policy implementation and negotiation.